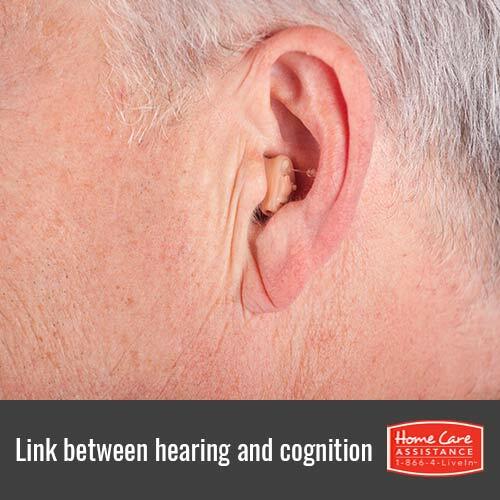 What Are the Links Between Hearing Loss and Cognition? Though hearing loss can be inherently challenging, research suggests this condition can also directly impact a senior’s cognitive function. Oakville home care experts recommend gaining a better understanding of the links between the two to help protect your loved one’s health. We actually hear with our brains, not our ears. If your loved one has hearing loss, his or her brain will divert extra energy to processing sound. The resources that would normally be used to encode memory into the brain are used instead for basic comprehension of auditory stimuli. This may not be a significant problem in the short term. However, this constant stress and drain of resources devoted to memory will eventually decrease the brain’s resilience. Imaging studies show older adults with hearing loss have reduced amounts of gray matter in the areas of the brain designated for receiving and processing sound. These portions of the brain actually begin to shrink due to lack of stimulation. Experts suggest these structural changes in the brain contribute to cognitive decline. It is unclear whether the atrophied portions of the brain will return to normal if hearing becomes better. Older adults with hearing difficulties often withdraw from social situations due to the challenges of engaging in conversation. Although the exact reason is unclear, social isolation is a well-known risk factor for cognitive decline. One theory is that the brain needs the challenges of daily interactions to continue to build new neural pathways. Another theory suggests loneliness and depression place the body under physiological stress, which can trigger inflammatory and chemical changes in the brain, leading to cognitive decline. Health conditions common among the elderly may affect both hearing and cognition. For example, built-up cholesterol and other fatty deposits can cause the blood vessels of the ear to lose their elasticity and the blood flow to become more forceful. This causes a ringing in the ears, which makes it harder to hear normal sound. These same deposits can also reduce blood flow to the brain, resulting in vascular dementia. When a senior loved one has developed hearing loss or a memory-related condition, it can be difficult to know the best ways to help. Providing your loved one with around-the-clock safety monitoring, help with daily tasks, and companionship from a professional caregiver can ensure he or she gets the necessary assistance. In addition to providing specialized care for cognitive disorders such as Alzheimer’s and dementia, Home Care Assistance also offers post-stroke and Parkinson’s care in Oakville. For more information on our senior care services, call one of our qualified Care Managers at (519) 590 2792 to schedule a complimentary in-home consultation.